UK: Wetter and windier conditions and more operational onshore wind capacity meant utility SSE's renewable energy output increased in the last nine months of 2017. Its wind generation output increased from 3TWh to 4TWh in the nine months to 31 December, while its renewables output was up by around 14% year-on-year, over the same period. By 2020, SSE expects its renewable energy capacity (including pumped storage) to grow by 4.3GW and to be capable of generating 12TWh a year from renewable sources it said in a trading statement for the third quarter of 2017. It produced 6.5TWh in nine months to 31 December. This increase in capacity could include power from the up-to-1.5GW Seagreen offshore wind farm (Firth of Forth Phase One) in the Scottish North Sea, which it jointly owns with construction company Fluor. Following a judicial review in November, consent was reinstated for the project. SSE also commissioned 516MW of new onshore capacity in the last nine months of the year, including its 171MW Galway site in western Ireland, and currently has 481MW in construction — both onshore and offshore, it confirmed. SSE also confirmed that it still expects the 588MW Beatrice project — of which it owns 40% (235MW) — to be commissioned in 2019. "Substantive progress" has been made on the North Sea site, SSE stated, with 36 of 84 turbine jackets now installed. It expects its capital and investment expenditure for 2017/18 will now total around £1.6 billion (€1.82 billion) — down from the previously anticipated £1.7 billion (€1.93 billion). SSE did not give an explanation for this decrease. Its capital expenditure in the nine months since 1 April 2017 totalled £1.1 billion (€1.25 billion), including about £355 million (€403 million) in wind (both onshore and offshore). SSE also confirmed that the planned merger of its household energy supply and service business with Innogy subsidiary Npower — and so possibly the creation of the UK’s second biggest energy supplier — "remains on course to be completed by the last quarter of 2018 or the first quarter of 2019". The company also stated that it "expects to report an annual increase in the full-year dividend that at least keeps pace with Retail Price Index (RPI) inflation". 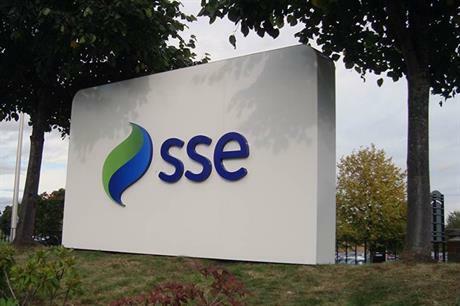 Alistair Phillips-Davies, the utility’s chief executive, said: "The SSE group will evolve significantly between now and the end of the next financial year. "There will be a greater focus on creating value from owning, operating and developing assets and infrastructure; and we will contribute to the creation of a new energy supply market model that combines the resources and experience of two established players with the focus and agility of an independent supplier."